Like most men of my age and social station, I'm constantly looking for a way to class up the drab walls of my home office. Sure, that framed Goonies one-sheet is nice and all, but even the finest art galleries rotate their pieces to keep things fresh. That's why I was extremely interested when ComicsAlliance editor Andy Khouri found the original oil painting above, painted by Joe DeVito over pencils by long-time Catwoman artist and current Tarot: Witch of the Black Rose auteur Jim Balent available for sale on eBay, that never-ending yard sale of the Internet age. After all, if there's one thing I've proved over the years, it's that I've got no shortage of affection for Balent's work. The only problem is that I don't quite have the funds available to buy it right now. Because the asking price for this painting is $423,000. On the bright side, that does include free shipping. 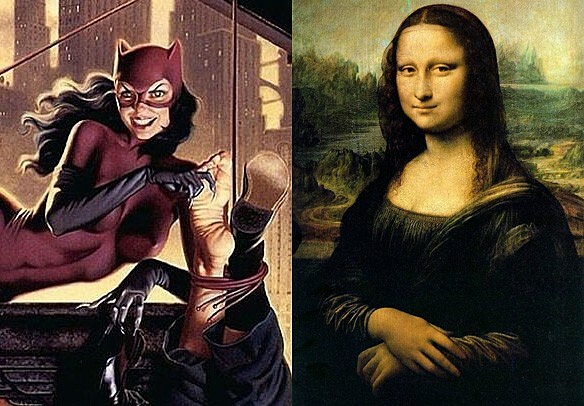 The most obvious comparison, of course, is the enigmatic smile (slightly more pronounced for Catwoman), but most fine art scholars have agreed that the Mona Lisa's flowing dress is definitely covering up a totally sweet rack lovingly outlined in purple lycra. Also, if you browse through Da Vinci's original notes for the painting (bring a mirror! ), you'll notice that his original sketches definitely included a strong theme of foot fetishism that was removed for the final version at the request of Florentine merchant Francesco Del Giacondo in order to prevent a scandal surrounding his notorious "perversioni dei piedi." Seriously, ask about it at your local museum or public library. All documented. All true. 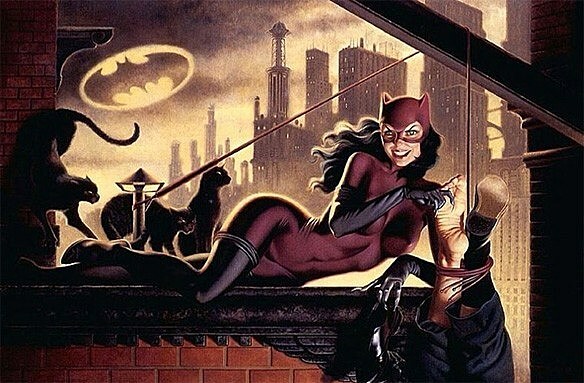 I have to say though, even as someone who recognizes the historic significance of this Catwoman painting and something of a Jim Balent enthusiast, I still think that the $423,000.00 price tag might be a little too high for the average buyer. But the more I think about it -- and I assure you, I've been thinking about it a lot -- the more I think that this might actually be by design. I realize that we threw traditional ideas of logic right out the window right about the time the listing hit eBay, but the only reasonable explanation I can come up with is that the painting is currently owned by a couple, and one party has insisted that the other party get it out of the house now, with the other responding fine, he'll put it on eBay, but if it doesn't sell in a month, they're keeping it. Of course, I might be completely wrong about that, but I'll tell you what: Knock that sucker down to a quarter-million and we'll talk.